The University of Louisville has received a $6.7 million grant from the National Institutes of Health to become one of fewer than two dozen Superfund Research Centers across the United States. The five-year grant comes after a 20-year effort by the university to secure Superfund money for environmental study and will establish a new, multidisciplinary center at UofL that will support the federal Superfund Hazardous Substance Research and Training Program. UofL was one of five new Superfund Research Center sites funded in 2017, bringing the number across the nation to 23, including such institutions as the Massachusetts Institute of Technology, Columbia University and Duke University. "The University of Louisville is joining an elite group of research enterprises in this growing field of study examining the impact of environmental determinants to health conditions," said Gregory Postel, M.D., interim president of the University of Louisville. "The work performed here will impact the field for generations to come, not only from the research findings that come from the program, but from the next generation of researchers who will be educated and trained." 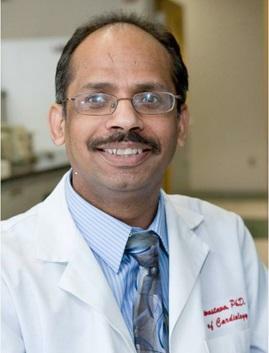 "This is a very prestigious grant for the university and will help raise the awareness of environmental issues as they relate to health, and train the next generation of environmental scientists," said Sanjay Srivastava, Ph.D., a professor and researcher in cardiovascular medicine at the UofL School of Medicine who will lead the project. Researchers will study how chemical exposures, particularly to chemicals known as volatile organic compounds (VOCs), contribute to the incidence, prevalence and severity of cardiometabolic disease as it relates to cardiovascular disease, type 2 diabetes, obesity and fatty liver disease, all big problems in Kentucky. The Superfund program, created in 1980, is part of a federal government effort to clean up land in the U.S. that has been contaminated by hazardous waste, and identified by the U.S. Environmental Protection Agency as a potential risk to human health or the environment. The program was started in part by the discovery of a waste site near Louisville in Bullitt County. Known as the "Valley of the Drums," the site contained thousands of steel drums full of chemical waste that accumulated over decades. Currently, there are hundreds of Superfund sites across the country, and Louisville has one near the Rubbertown industrial area along Lees Lane in the western part of the city. The grant to UofL comes through the National Institute of Environmental Health Sciences Superfund Research Program, which funds university-based research on human health and environmental issues related to hazardous substances. The program's goal is to understand the link between chemical exposure and disease, reduce that exposure and better monitor the effects on health. While the government tried to make Superfund sites safe, it was not completely known exactly how toxic some of that waste was, or how it could exacerbate diseases. Waste at Superfund sites includes such substances as industrial solvents, pesticides, metals, dry-cleaning solvents, paints, wood preservatives, cleansers, disinfectants and gasoline and other petroleum products that generate VOCs such as butadiene, trichloro ethylene, benzene, acrolein, vinyl chloride, and formaldehyde. When disposed of together, these substances can react and form compound chemicals that are even more toxic. "The task of cleaning up those sites proved easier said than done," said Srivastava, who also is a Distinguished University Scholar at UofL. In its heyday, Rubbertown was a booming industrial site with multiple factories and plants. Today, manufacturing in the area is down about 90 percent and the EPA closed the Superfund site to waste disposal about five years ago, satisfied that the waste disposed of there no longer posed a threat. But residents have continued to complain about chemical odors from the site, and the EPA has made multiple visits back as it considered reopening the site for remediation, Srivastava said. Studies already have associated certain chemicals with heart disease and metabolic disorders. Excessive rates of type 2 diabetes and stroke have been found in an evaluation of 720,000 people living within a half-mile of 258 Superfund sites associated with excessive VOCs in drinking water. "There is strong evidence that insulin resistance, type-2 diabetes, fatty liver disease and cardiovascular disease are associated with environmental exposures" Srivastava said. UofL's Superfund Research Center will focus on residents around the Lees Lane Landfill, a 112-acre landfill in Southwest Louisville. The site was used for a quarry in the 1940s and 1950s and was used as a landfill through 1975. The EPA placed the site on the Superfund program in 1983 because of contaminated ground water, surface water, soil and air resulting from landfill operations. Steps were taken to clean up the site and the EPA removed the site from the National Priorities List in 1996. However, the most recent estimates were inconclusive regarding remedy protectiveness, Srivastava said. The Superfund team will measure pollutant exposure at the site, and compare pollutant levels at this site with those in the Rubbertown site with its multiple factories and plants. Nearly 38,000 people live within three miles of the site. Using data from the U.S. Census Bureau and death records from 2005-2009, UofL researchers have observed a 48 percent higher cardiovascular mortality in 26 neighborhoods around Rubbertown than in nearby Louisville areas. The UofL team hopes to enroll 500 participants from three geographic areas in the project: one near the Superfund site on Lees Lane; one farther away, but still in Rubbertown; and one not nearby, in Oakdale. Researchers will set up continuous air monitoring at the sites, as well as mobile monitoring in different areas to help determine how far the level of gaseous pollution from the ground extends. They will collect current health and demographic data and medical history, and look for evidence of chemical exposure in blood, urine and other samples. Participants' blood chemistry, obesity and cardiovascular and liver function will be monitored after 18 months and 36 months. The team also will study the cardiometabolic effects of VOCs in animal models. The other part of the project will focus on developing sensors for measuring VOCs in the air and constructing a land-use model to decrease ambient VOCs. The project also will test whether planting trees – known to help reduce the effect of exposure to toxic particles and VOCs in the air and soil – would improve the health of residents in the Oakdale area under the Green Heart project, launched last month.